Is "publicity" still important to an author today? Spoiler: Yes. With so many authors today forced to go it alone, too many of them make the mistake of dismissing publicity as being out of reach. The truth is that you have more access to the media than at any time in human history. You have more opportunities for media attention than ever before. You have the tools within reach to create the kind of publicity materials that will make an impact. In this webinar learn five myths about publicity—and how you can start making an impact today! Chris Well is a media veteran with 30+ years’ experience working in magazines, newspapers, broadcasting, and digital media. In that time, he has been a magazine editor, columnist, journalist, broadcaster, and teacher, with field experience covering music, publishing, human interest, and more. (There was also that time he was the editor of a bridal magazine.) 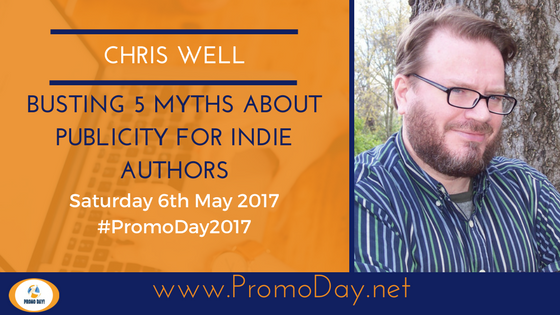 Also a published novelist, Chris has written suspense and mysteries for traditional publishers and as a self-published author. Get in touch with him on Twitter at @BuildYourBrandA.